i already asked on the mailing list a few weeks ago, but now i want to get some suggestions here! I changed my mind twice: first i wanted to run my own written adventure, then i wanted to run Drakken Ruins and NOW i want to ru "The Puzzle Box"
The Adventure has no real end and it will be open game (i'll lead the game on montly game event), it isn't possible to split the adventure. The PCs manage to escape from the tomb (or prison) and thats it. They know WHO put them in there, but not why. Aquilane will say something like "I see. You survived. What a pitty, you deserve to die". Still the PCs don't know why. Aquilane will continue "Ahh i forgot, you can't remember"
---Now heres the problem: Its my first time as Gamemaster and i don't know if i just can say.. "Roll on x, success -> You remember that you saw Aquilane a few times, but you always treated him nice. Once you met him in the eastern lands, when you...when you were hunted by a group of Kang. The Kang never came near to your group, something seemed to stop them...Did Aquilane pass their way?" The other variant: Aquilane put a spell on the PCs. They remember this event, BUT its blocked somehow. Thats why they never tought about it earlier, when they realized that they were trapped by Aquilane. After they spoke to Aquilane a fight will occure, he wants his revenge. Thinking hard about a good ending...if you have any s uggestions please tell me!! Bangrim wrote: ---Now heres the problem: Its my first time as Gamemaster and i don't know if i just can say.. "Roll on x, success -> You remember that you saw Aquilane a few times, but you always treated him nice. Once you met him in the eastern lands, when you...when you were hunted by a group of Kang. The Kang never came near to your group, something seemed to stop them...Did Aquilane pass their way?" Alright I haven't read the adventure so my response is based solely on what I have read here. I just want to make sure I have this right. What is quoted above is hard fact right? I personally prefer the first option. Then again that is just me. I would like to think that a group of starting PC's didn't even attempt to warn Aquilane, much less attempt to aid him (assuming the Kang party was small). What do you mean by "background" exactly? Are you referring to creating a proper flashback or series of flashback scenes or about creating the story for what really happened with Aquilane and the party in the Eastern Lands? Download the Talislanta library or take a Virtual Tour! - - - - - - - - -The Tal Scanning Project needs your help! The whole "Aquilane Thing" would be "background story", because it happened if the player want it or not. They didn't played the eastern land "adventure", they start a inn a few months after that adventure. What i mean with background? I mean something like: What the PCs done in their past, events that made the PCs the way they are. Maybe a player wants his character to be a complete rookie, whos the first on a "adventure". When i tell them that they have been to the eastern lands a few months ago, the PCs can't make up their own story. But i should keep in mind its only a one-shot. 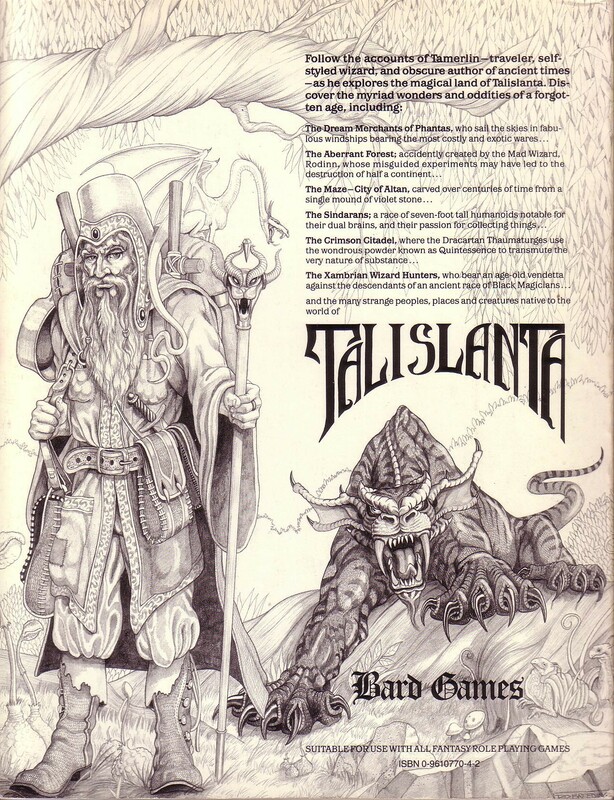 Probably i'll never play Talislanta in the same round again. I think i'll use the first option! Ahh I see! Sorry, bit of a neophyte in pen and paper gaming. Been involved heavily since mid 2007 but my actual game participation (i.e. experience) is embarrassingly low. Option 1, for the win! As a one-shot b.character background may be less important than just the playing, if you want you could type up a more detailed backgound for the pc`s to read (sometimes done for tourney play) that might make it easier to figure as you write it up. I`m not a fan of one-shots personally. Azaghal wrote: As a one-shot b.character background may be less important than just the playing, if you want you could type up a more detailed backgound for the pc`s to read (sometimes done for tourney play) that might make it easier to figure as you write it up. I`m not a fan of one-shots personally. I really appreciate the offer but my plate is getting rather full. We just started playing BattleTech again. I'm currently reading Legends Of Anglerre, which I will use to get a FATE based game of Sundered Skies going. Now once that game is underway I will be in a place to do what I really want to do as my next project; make a complete A Time of War (BattleTech RPG) to FATE conversion. That conversion will be a big adventure for me as it will be my first conversion and I plan for it to be rather exhaustive. At this time I plan to build it using a combination of Starblazer Adventures, Mindjammer, Diaspora, Strands of Fate, and FUDGE. While I've done my review and forum questions research, the only book among them that I have read is FUDGE . I'm getting World In Flames for Xmas which I hope, oh how dearly I hope, will be up and running within one weeks time of unpacking . There are still a few gaming products left to pick out but this year, but it looks to be a wargame and wargaming supplies closeout. This BattleTech revival has made my wargame hunger absolutely insatiable as of late. I'm also getting that "build it all yourself" bug. I picked up some Shrinky Dinks from Hobby Lobby that I am going to attempt to make some colored mini's out of. From what I have seen on crafts sites they should come out pretty nicely but it's just one of those things I won't quite believe in fully, until I see it for myself. Also coming this Xmas, which I am super excited for, is a copy of Wargaming On A Budget! Please note my comment assumes your playing said one-shot with your regular gaming group. When it comes to giving a system a go or checking out something completely new, I think they are quite handy. Folks over on the FUDGE mailing list have ridiculous success with one-shots at just about any public gaming event. To learn a system, or decide if you want to check it out oneshots work quite well. Sorry for that. I've run a few Talislanta one-shots at conventions where there's a dedicated group of gamers and a 4 hour slot to play. What I did was have a stable of pre-made characters (I've mentioned them in another thread) and an adventure that I can just drop them into. The last time I did this, the adventure was to sail out on a windship to where another windship had crashed, salvage what they could from the wreckage, look for any survivors, and get back home. I actually had 2 separate games built from this. One was straight-forward. Sail there, 1 encounter nearby with some wind and storm demons. Find the ship, fight off some bad guys (za, beastmen, or araq; depending on how the group seems to be reacting to Tal's strangeness), rescue what's left of the crew, get some salvage, head home. Usually ran from about 2.5 to 4 hours depending on the group and the number of people in the group. The second was slightly different. It was re-written for a tiered convention event where a group of folks play in one half of an adventure (about 2-3 hours), and then a second group finishes the adventure (also about 2-3 hours). You might have a completely different second group, it might be mostly the same folks, etc. The re-write was mostly the same. Fly out, encounter on the way, deal with crossing some borders. Of course, once they got to the wreckage, there were complications. The windship that had crashed was actually not a friendly one, but one from the Midnight Realms and the Tarteran crew were a bit nervous about captured while in this strange land. The first adventure was fairly straight-forward and meant to get folks involved in the game system; the re-write was more to take folks familiar with the system and explore some of the cultures with a tiny bit more depth. 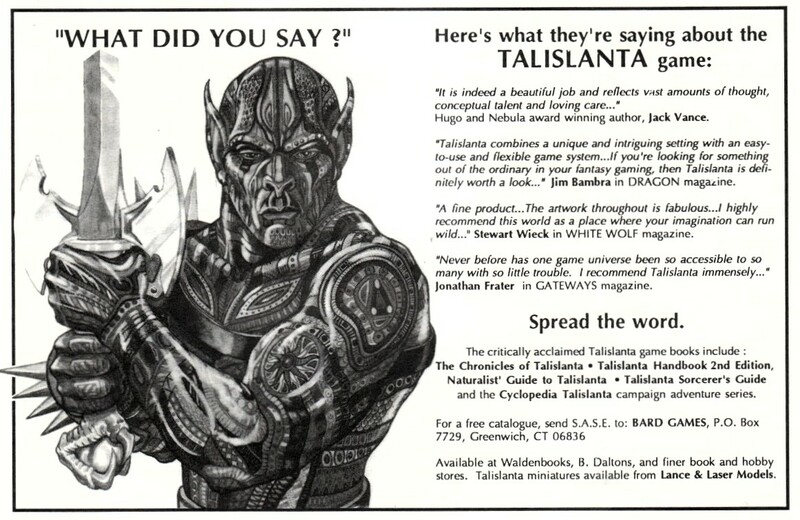 http://www.talislanta.com - Home of 20+ years of Talislanta material and the new Talislanta: Savage Lands. I got this adventure just now, years after it was written, but I think it's brilliant! Congratulations!